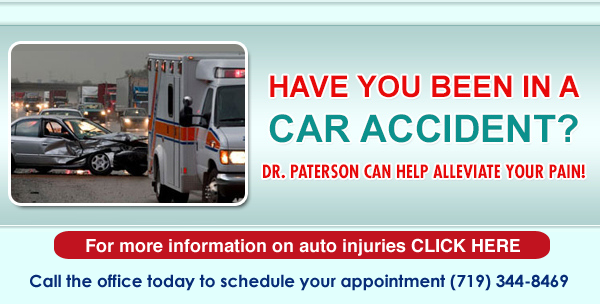 Click here to learn more about Dr. Paterson! Whether you’ve been injured in an automobile accident, have injuries from a particular sport or activity, have pain from arthritis or other degenerative conditions or suffer from other health related conditions…Chiropractic care can help! Dr. Paterson is a National Registry Certified Medical Examiner (FMCSA) and provides CDL/DOT Physicals and DOT/Non-DOT Drug and Alcohol Testing. DOT/CDL Medical Exams are $85. Call and schedule your appointment today at 719-344-8469. We accept all auto and most group insurances. For accepted payment options click HERE. Our personal commitment to you...is our promise to provide you with the best care available. Our primary goal is to deliver fast relief for acute and chronic pain conditions and to enhance your quality of life through the early detection and prevention of disease. We strive to not only prolong life, but to ensure that those years are enjoyed in a productive and vital fashion.